In case you hadn’t guessed, I’m in love with my new Instant Pot. I would highly suggest if you get one to watch some of the videos on youtube to help you get started. Actually I started watching them while waiting the 2 days for Amazon to send it in the mail. Although this recipe is my own, I watched several meatloaf videos before tackling it in the Instant Pot. My technique is a little different than most, but I had great results. My husband ate 2 helpings and wants a sandwich for lunch tomorrow. A 30 minute meal that tastes like you cooked it all day. Yum! Put the meat on a large board or in a large bowl to make the loaf. Add vegies, crushed crackers--I prefer crackers to bread crumbs, but if you like bread crumbs, that will also work--eggs, seasonings and parmesan cheese and mix thoroughly with your hands until it makes a nice loaf. Turn on your Instant Pot to "Saute". Add the olive oil and wait until the indicator light says "HOT". Make an even loaf, mine was round like the pot, and place the loaf in the bottom of the pot to brown the bottom. I think browning adds flavor and gives balance to the loaf. While the loaf is browning, peel your carrots and potatoes and cut them into sections. These will be fully cooked at the end of the cycle along with the meatloaf. By the time you finish peeling and sectioning, the meatloaf will be browned about right. Add the carrots and potatoes around the outside of the meatloaf. Pour about 1 and 1/2 cups hot water into a measuring cup and add 1 Tbs beef soup base. Stir until dissolved and add 1 Tbs worchestershire sauce. Pour around the edges of the meatloaf and over the carrots and potatoes. Push the meat cycle and lower the minutes to 20 minutes. Be sure your valve is set to sealing. After the cooker has gone through its cycle, let it naturally depressurize for 10 minutes. Then do a quick release for the rest. Remove the carrots and potatoes to a plate. Put the 1/4 cup ketchup over the top of the loaf and set the Instant Pot on steam mode for 2 minutes. Do a quick release of pressure and use 2 spatulas to remove meatloaf to plate. My husband and son loved this meal. It's very hearty and all of the flavors blend to make a savory scent you won't believe. Of course, you can use your own seasoning and it will still come out the same way. I was very surprised about how firm and in tact this meatloaf was. I really expected it to fall apart, but it kept it's shape nicely. I want to make your meatloaf, but how do you get the raw meatloaf into the hot pot for sauteeing? I just made a round loaf that was about an inch and a half thick and dropped it in. To get it out, I used 2 spatulas and put it on the plate that way. It held together really well and sliced nicely. I made this last night using ground turkey. I used one egg, panko bread crumbs, lots of pepper and beefy onion soup mix. I put strips of sautéed red, yellow, orange, green peppers and onions on top covered with ketchup and barbecue sauce. It was awesome. Thank you so much for sharing this recipe. I had no idea of how to make this in the Instant Pot before I read your recipe. I loved the addition of Parmesan cheese, and I agree with you that browning it first really makes a difference. Next time I am going to try to use the Instant Pot rack so it will be easier to remove from the pan, although I am not sure if I can brown the loaf with the rack in place. My family loved this. Third recipe I tried in my new IP and it was a hit. I made this with 80% lean ground beef and chopped the onions and bell pepper really small (I recommend that) and it turned out so yummy! I have never heard of the Weber Chicago brand steak seasoning but I had a big Costco container of Montreal Steak Seasoning so I just used that instead. I love how this sliced so well and I could even slice it super thin if I wanted to. We’ll be having this regularly, thank you for sharing this recipe! 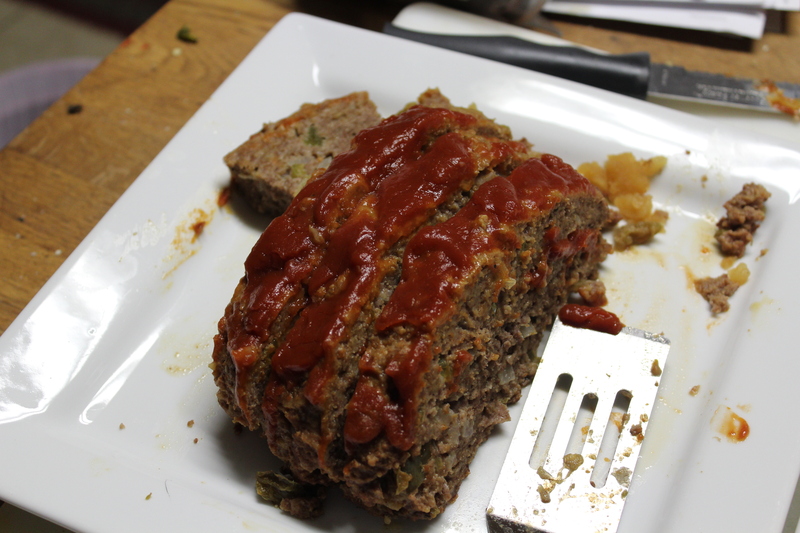 I made this recipe for my family yesterday, and I have to say it was the best meatloaf I’ve ever tasted in my life! This recipe is absolutely amazing!! Definitely have to try it. The loaf was very moist and tasty. The only variation I made was the Weber seasoning because I didn’t have it, so I used McCormick Grill Mates Brown Sugar Bourbon. Everything else I followed. Very good and highly recommend it. Super easy to make. If you are cooking only the meat loaf without carrots and potatoes, do you use the same amt. of liquid in the pot? Yes, I put the water around the meatloaf. Without the water, the pot won’t pressurize.